This tree in Colorado Tree is available through Colorado nurseries. Several species are doing well at The Plant Environmental Research Center at Colorado State University. The State Champion tree is located in Englewood and has a 30 inch diameter and is 75 feet tall. Hardiness Zones 2 to 5. 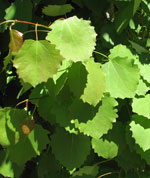 Foliage Alternate on the stem with a shape similar to native aspen. Leaves are 1-3 inches long with a coarse toothed margin. Dark green above and a lighter silver green underside. The petiole is often as long as the blade. Fall color can range from orange to red. Flowers and fruit The male form of this tree is cottonless. Bark Older wood is smooth and light gray. Smaller stems are often dark gray to black. 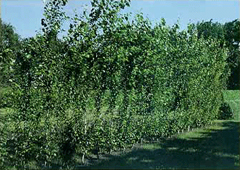 Insects and diseases The Swedish columnar aspen is much more resistant cankers then most of the other aspens. It can be highly susceptible to the Bronze Leaf disease and should not be planted in areas where this disease has been identified. 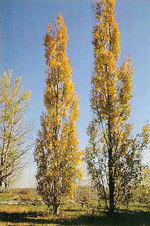 Best advice Swedish columnar aspens need moderate to high soil moisture and are more disease resistant and long-lived than Lombardy poplars. 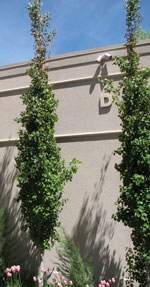 They are excellent for screens, hedges, shelterbelts, or as an accent tree. Because of the narrow growth habit these trees are also good for small yards.